South Tahoe senior Kaitlyn Janese drives upcourt this year for the Vikings. Incline’s Madison Corneil and Whittell’s Brianna Johns were also nominated for the award. Kaitlyn Janese discovered basketball about five years ago and has since developed a passion for the game. She has played in all four years at South Tahoe High School and hopes to play at a higher level after she graduates in June. And if she continues to transform the way she did from her junior to senior season, her hoops future is bright. Janese helped turn the Vikings into playoff contenders this season. The team won nearly twice as many games than in her “disappointing” junior year. 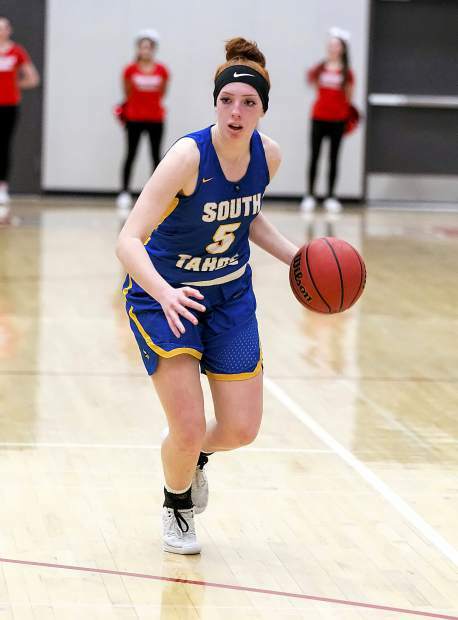 She was one of the 3A Northern League’s top rebounders and had a stretch of games in January where she averaged nearly 10 points and 10 rebounds per game and ended the month with a career best. Through her work on the hardwood and in the classroom, Janese is the Tribune’s Student-Athlete of the Month for January. Janese started the month with 15 points and rebounds in a victory over North Valleys. A few days later she recorded eight points and 13 boards as the Vikings nearly upset Truckee. Janese kept putting up stats and over a span of five games averaged a double-double. She finished off the month with a career best 18 rebounds. For the season, Janese averaged 6.1 points and 7.5 rebounds per game. Her rebounding total was fifth best in the league and she was the Vikings third best scorer. As a junior she averaged 2.2 points and five rebounds per game. Janese credits her older sister, Claudia, for getting her into basketball. Claudia Janese is a couple years ahead of Kaitlyn and recently earned All-American honors for her stellar season with the Lake Tahoe Community College Coyotes. Since her sister got her started, Kaitlyn has been under the tutelage of Neiger. Janese has played other sports during high school, including soccer, volleyball and softball, but hoops is No. 1 and she hopes to join a club team this spring to further develop her skills. She has plans to play softball, so however it works out, she plans to dedicate herself 100 percent wherever she plays. She also likes cross country skiing, and the decision was not that easy when deciding on what winter sport to play. Although skiing was never her favorite sport, she enjoyed her time on the slopes. She can’t remember a winter where South Lake Tahoe got more snow. “By far the most I can remember,” she said. Kaitlyn may stick around the South Shore and attend LTCC for a year. She plans to study business and also real estate. But she also may follow in her sister’s, and family’s footsteps, and head east. Claudia signed to play with a college on the East Coast and the family is also planning a move, Kaitlyn said.